Filming is underway in Perth on the Artemis Media production DON’T STOP THE MUSIC, a new three-part landmark documentary series, highlighting the transformative effects of teaching music in primary schools. 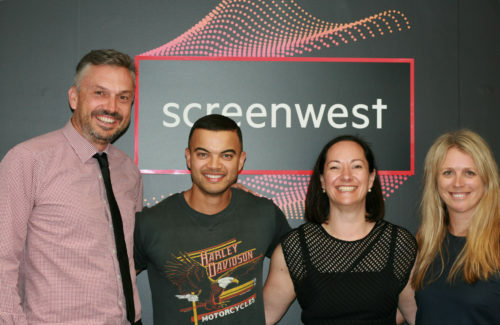 Lead talent Guy Sebastian and Dr. Anita Collins popped into Screenwest’s office on a break from filming. Guy Sebastian and Dr. Anita Collins are musical mentors on DON’T STOP THE MUSIC, which follows one underprivileged Australian school’s journey to musical literacy. The series will showcase leading music educators as they train the school’s teachers, giving them new tools to teach their students to play instruments and sing. The school will introduce a new music program into its curriculum, using instruments donated from the wider community. Throughout the series, Guy Sebastian will encourage the students to step up and persevere with their instruments, workshopping songs and drawing inspiration from his own musical journey. The result of this new approach see benefits to families and the community, as the school establishing a vibrant and sustainable culture of music. As Guy explains, the importance of music in the school curriculum cannot be underestimated. The series is made in association with ABC, Screen Australia and Screenwest and is backed by Musica Viva and the Salvation Army. Celia Tait is Producer with Executive Producer Joan Peters and ABC Executive Producer Sally Chesher.